In Jaguar British Racing green with green seats. Completed in 1992 by a talented enthusiast, this very pretty 7 Special is constructed on a long wheel base chassis, boxed and modified, and has an uprated engine. It has a full tonneau and is fitted with aero screens. It also comes a full windscreen and hood. The gearbox is a four speed unit with a remote change. 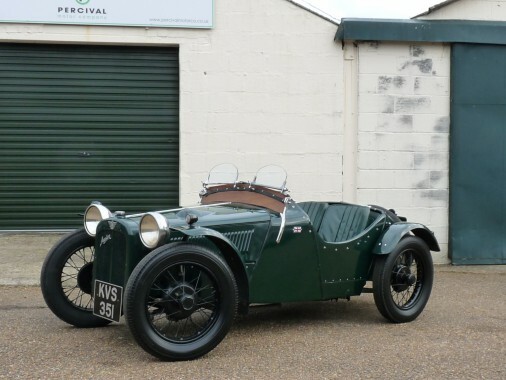 The two seater bodywork is very nicely constructed and features cut down Riley bonnets and cycle wings. The suspension has been lowered and modified to suit, there are four wheel brakes and 17" wheels. The engine has a Ruby cylinder head, bigger valves with double valve springs, a Newman Racing camshaft, a lightened flywheel and Australian race pistons, all crack tested and balanced. The oil jet size has been increasd for better flow, a Mini oil filter and an electric fuel pump. The radiator has been uprated. The build and all the upgrades and modifications are documented with comprehensive notes and diagrams of the work. A solicitor acquired the Austin in 1998 and kept it until 2018. It has covered very little mileage since build and has mellowed nicely. A very handsome and well built 7 Special - hilarious and terrifying to drive in equal measure!